This deduction is good on new and used equipment, as well as off-the-shelf software. This limit is only good for 2015, and the equipment must be financed/purchased and put into service by the end of the day, 12/31/2015. 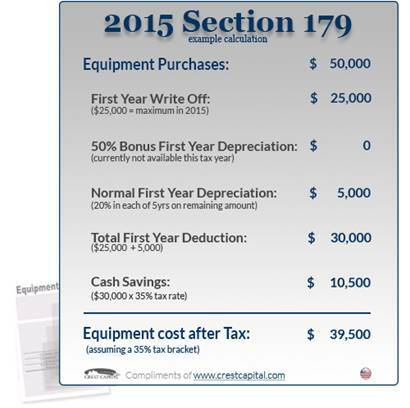 This is the maximum amount that can be spent on equipment before the Section 179 Deduction available to your company begins to be reduced on a dollar for dollar basis. This spending cap makes Section 179 a true "small business tax incentive". In prior years, Bonus Depreciation would be taken after the Section 179 Spending Cap is reached. Note: Bonus Depreciation was available for new equipment only; in 2015, Bonus Depreciation is not available at all. The above is an overall, "simplified" view of the Section 179 Deduction for 2015. For more details on limits and qualifying equipment, as well as Section 179 Qualified Financing, please read this entire website carefully. We will also make sure to update this page if the limits change. Contact CC Machine Tools to find out more about your finance options now!